Perhaps this posting will help a few people understand that in fact, skepticism about vaccines/vaccination is a phenomenon that’s growing like the proverbial weed – & won’t be going away any time soon! Also, that it’s not just “nutbar” parents with nothing better to do than question vaccines – but in fact, the “hesitation” is scientifically well-founded, and becoming increasingly shared among doctors with inquiring minds. What follows is a series of quotations from MDs (in the U.S.) who are now major vaccine skeptics. All of whom, I believe, are formerly vaccinating doctors. An important point! Okay! Let’s launch right into it. “There is no convincing scientific evidence that mass inoculation can be credited with eliminating any childhood disease. It’s true that some diseases have diminished or disappeared in the US since inoculations were introduced, but one must ask why they did so simultaneously in Europe, where mass immunization did not take place. There are significant risks associated with every immunization. Yet doctors administer them routinely without warning parents or determining whether they’re contraindicated for that particular child. No one knows the long-term consequence of injecting foreign proteins into the body of your child, and no one is making any structured effort to find out. ** My source: Vaccines – A Reappraisal, by Richard Moskowitz, MD, pg. 47. ** My source: Vaccines – A Reappraisal, Richard Moskowitz, MD, pg. 47. “The most memorable event was in the winter of 2009, when the H1N1 flu vaccine was given. Three patients in close succession were wheeled into the ER with total kidney shutdown. When I talked to them, each one volunteered, “I was fine until I had that vaccine.” All three had shown normal kidney function in their outpatient records, and all three required dialysis. Two recovered, and one died of complications several months later. I began taking vaccine histories on all my patients, and was often startled by what I heard. Several had been admitted with normal kidneys but had their health decline within 24 hours of the vaccine, and even these well-defined and documented cases were denied as vaccine-induced by my colleagues, except for the rare doctor or nurse who would agree with me in private, when nobody was listening. I resolved to find out everything I could about safety trials for vaccines. What I learned led me to leave my practice and become a full-time researcher on vaccination and the immune system.” – from Dissolving Illusions – Disease, Vaccines, and the Forgotten History, Suzanne Humphries, MD & Roman Bystrianyk (Introduction, pp. xii-xiv). 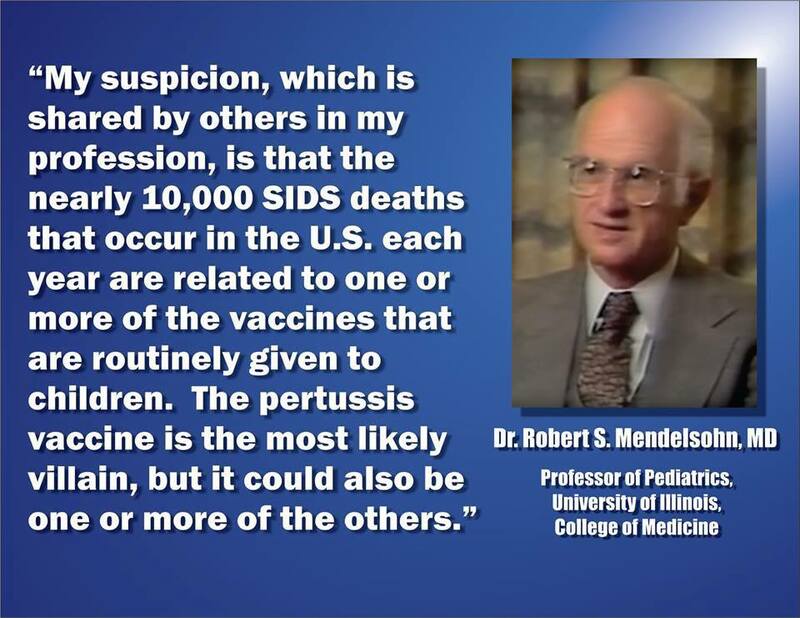 ** My source: Vaccines – A Reappraisal, Richard Moskowitz, MD, pg. 48. Dr. Humphries discusses vaccine safety, efficacy, history; how the immune system works, the importance of breastfeeding, aluminum in vaccines - much important material is covered in record time! “I used to tell them that there were, indeed, adverse reactions, associated with the vaccine – I was not one of those doctors who would gloss over such unpleasant details – but that we doctors were told that the adverse reactions that might occur after the pertussis vaccine were at least ten times less likely than the chance of getting complications from having the disease, and that, essentially, the point of giving their child the vaccine was to prevent them from getting the disease. Indeed, I used to think that parents who didn’t want to vaccinate their children were either ignorant, or sociopathic. I believe that view is not uncommon among doctors today. Why did I have this attitude? Well, throughout my medical training I was taught that the people who used to die in their thousands or hundreds of thousands from diseases like diphtheria, whooping cough and measles – diseases for which there are vaccines – stopped dying because of the introduction of vaccines.” From this 2015 article. “Children seen in the vaccine clinic would come to our ER with seizures, respiratory arrest, and asthma attacks. I began to realize that not all children respond well to vaccines, and that some die. Later I began to see the fraud and corruption in the Advisory Committees and in how vaccines are marketed. I had no idea that those killed and injured had no recourse against either manufacturer or physician. Manufacturers enjoy full immunity from lawsuits, and the Vaccine Court is almost a secret, yet has paid out $3 billion since 1986. [Now over $4 B.] The VAERS system is also poorly advertised and the government admits it receives only about 10% of the adverse events that occur. We mandate more vaccines than any other country, and have a higher infant mortality rate than some third world countries. Most kids do OK, but some don’t. Genetics and timing are also important; no drug or dosage is right for everyone. Federal cases against drug companies show that safety data are hidden, manipulated, and even fabricated. Most safety studies use fake placebos, like aluminum adjuvant for HPV, or a Meningitis Vaccine for Pneumo. All independent meta-analyses say that real safety studies are needed. There are 200+ new vaccines in the pipeline, and all of them will be approved, recommended, and mandated. Isn’t enough enough? ** My source: Vaccines – A Reappraisal, Richard Moskowitz, MD, pg. 49. “I was taught that vaccines were completely safe and effective, and for years I used them. But my experience and what parents and doctors were telling me, was that vaccines aren’t completely safe or effective. We were taught that polio, smallpox, and most infectious diseases went away because of vaccines. But the literature shows that diphtheria, tetanus, polio, pertussis, measles, influenza, TB, and scarlet fever were already waning before antibiotics and vaccines, because of clean water, better living conditions, sanitation, and nutrition. Other studies show that antibodies aren’t how the body is protected, and that some vaccines contain foreign DNA that accumulates in the body and brain, and impairs the immune system. What we have now is a one-sided way of thinking that doesn’t allow debate. It’s heartbreaking to see kids who were speaking, doing well, and developmentally normal, who lost their voice, made no eye contact, developed seizures, asthma, and allergies, and had nowhere to go because the doctor said it was a coincidence. The studies that deny any correlation between vaccination and autism don’t meet scientific standards.” – Palevsky, L., Jan. 2, 2012. “I could go on and on; … The roster of family doctors, pediatricians, and other doctors speaking out against mandatory vaccinations and questioning the official dogma surrounding them grows larger by the day. No matter where and in what matter they practice, or what their specialty, their arguments and objections are all remarkably similar, invoking and elaborating on the very same themes that Dr. Mendelsohn, presciently identified a generation ago. Rather than opposing all vaccines across the board, they favor a pro-choice position, as I do: they want safer vaccines, expose cover-ups, demand full disclosure by the industry and the CDC, insist on informed consent, and oppose making vaccination mandatory. Source: Vaccines – A Reappraisal, Richard Moskowitz, MD, pg. 50. VACCINATION TEACHING IN MED SCHOOL? Dr. Bob Sears Debunks Measles Hysteria 15 minutes. Please listen to this carefully. It covers media manipulation with fear, lies about measles being “on the rise,” death rates from measles (i.e., deliberate manipulation of statistics), unintended consequences of mass vaccination, etc..
Those Measles Outbreaks: Thoughts out of Season. Richard Moskowitz, M.D. “Vaccines are held to a lower safety testing standard than pharmaceutical drugs… The safety science behind vaccines is totally shady.” – Brandy Vaughan, former sales rep for Merck (from 'The Vaccine Panel: The Insider’s Report') ** check out Learn the Risk for plenty more from BV. Big Pharma-Backed Democrats Join GOP to Block Bernie Sanders’ Effort to End Drug Price Gouging By Lauren McCauley / Common Dreams Posted on Jan. 12/17. “Half of what you'll learn in medical school will be shown to be either dead wrong or out of date within five years of your graduation; the trouble is that nobody can tell you which half—so the most important thing to learn is how to learn on your own.” – Advice from Dave Sackett, the father of evidence based medicine, in this BMJ item ‘Thoughts for new medical students at a new medical school’ which came to me via this item on the Children’s Health Defense site. “The pharmaceutical industry is so powerful,” RFK Jr explained. “They give $5.4 billion a year to the media. They’ve gotten rid of the lawyers, so there is no legal interest in those cases. They have really been able to control the debate and silence people like me.” Here. & plenty about science, here, with other shockers about the state of science today. Science under siege! Check them out. ** There are simply tons more great information sources out there! Still, each of these is a great starting place. ** This site has many vaccine-related postings - all listed on the right-hand side of the main page, down below the quotations. The 2 previous postings, Is Vaccination a Religion? & 30 Things you may not know about vaccines both have plenty of information, and link to many other great information sources. It really kind of does seem that way to me. It’s something people accept on faith. … & become quite defensive about, when questioned. Be really skeptical (or hey! Even just curious!) about. There is also (in the case of vaccination) the demonizing of those who do not share the faith. Who really do dig into it in a big way. Shaming & vilifying those who wish to dig, even. Full disclosure: I personally am not a fan of organized religion, though I was raised in a (nominally) Christian household. I can even recall having one year been awarded a perfect attendance pin for being a faithful Sunday School attender! Religion & I parted ways quite a long time back now. I’m just pointing this out because I want to be upfront here about my views. I want to point out that most of us in fact know very little about vaccines, & how they actually work. Statements which are not, as it turns out, actually even vaguely true or accurate. ** Much information on polio & smallpox can be found in this Miscellany posting. Just scroll down to P &/or S within that posting to find many relevant resources. But we trot them out mighty quick, don’t we? We’ve all heard these lines, time & time again. We feel quite certain they must be true. that we now believe in implicitly. Though we don’t actually understand the hows & whys of it at all well, or deeply. But poke us the slightest little bit, & out of our mouths will fly those mantras, lickety-split … hmmmm? Please tell me about your research! The use of thimerosal & aluminum in vaccines, & also formaldehyde, Polysorbate 80 & various other things. Check out a CDC document here to see for yourself what vaccines contain. Some vaccines contain fetal DNA from aborted fetuses, which CDC describes as ‘MRC-5 human diploid cells’, ‘MRC-5 diploid fibroblasts’, ‘WI-38 human diploid lung fibroblasts, MRC-5 cells’. A graph in this location spells out which vaccines contain aborted fetal cells. Availability of scientific research on the connection between vaccines & autism, but not just autism – many other increasing conditions such as allergies, asthma, learning disabilities, ADHD, childhood cancer, arthritis (& other auto-immune conditions) etc. Our kids are NOT alright. … but this will do as a start. Tell me about your research! I’d be happy to tell you about mine. The books I’ve bought & read. Some whose children actually died as a result of vaccination. I know all too well that vaccination is a topic that gives rise to a range of emotions. Sometimes the feelings are so overpowering, the conversation shuts right down. I’ve witnessed all of the above. I’ve also felt (& feel) guilt & shame about my own complacency about it, for so many decades. when my own children were young … & ever since. This is one big, messy, complicated, fraught topic! But to treat it as virtually a religion… a phenomenon it seems we are not supposed to even question. That is just not acceptable to me. There’s far too much at stake! It IS the most important decision parents will ever make! With our eyes wide shut. And this will just not do! None of it happened overnight! It has a history – all of it has a history. But most of that is fodder for another essay, & another day. I do recommend that everyone watch the first episode, at the very least, of the series ‘The Truth about Cancer’ for a helpful bit of history on how our modern “health care” system evolved into what it is today, pretty much a delivery system for pharmaceutical drugs. It isn’t nice, & it isn’t pretty; it is quite disturbing, in fact – even deeply shocking – actually. (Yes, there are some BIG shockers involved.) But since our very health & lives depend on understanding what’s really going on, I do highly recommend spending this hour or two. We’ve repeated all our lives? We’ve been fed these lines like pills … for a reason. There’s an agenda involved here. To PR stunts & gimmicks? & their own (always purely profit-driven) motives? Have we forgotten we must always remember to #Follow.The.Money?? We’re very simple creatures, or so it seems to me, in many ways. We want to belong; we want to fit in. & we want more, always more. That is never satisfied, never content. We never ARE quite enough. For going along with the crowd. We are bid-able, we are obedient, we are compliant. And we are tremendously overly trusting, or so I have long since come to believe. He sure seems to have got that right! There is so much more I could say here. But … there are other things to do! Media (whose ads & even their “news” content is very much dictated by the desires & demands of advertisers; i.e., “He who pays the piper, calls the tune”) warn us daily, now, to be afraid. They have trained us recently to be terrified of measles! Keep us quiet, keep us busy. Keep us on the treadmill! Get from one end of the day to the other. Measles – a mild childhood illness many of us still alive today contracted & recovered from as children with no ill effects whatsoever! (along with all our siblings & our friends!) – has been transformed by the media into the modern-day equivalent of the bubonic plague. Suddenly, we’re absolutely terrified of it! 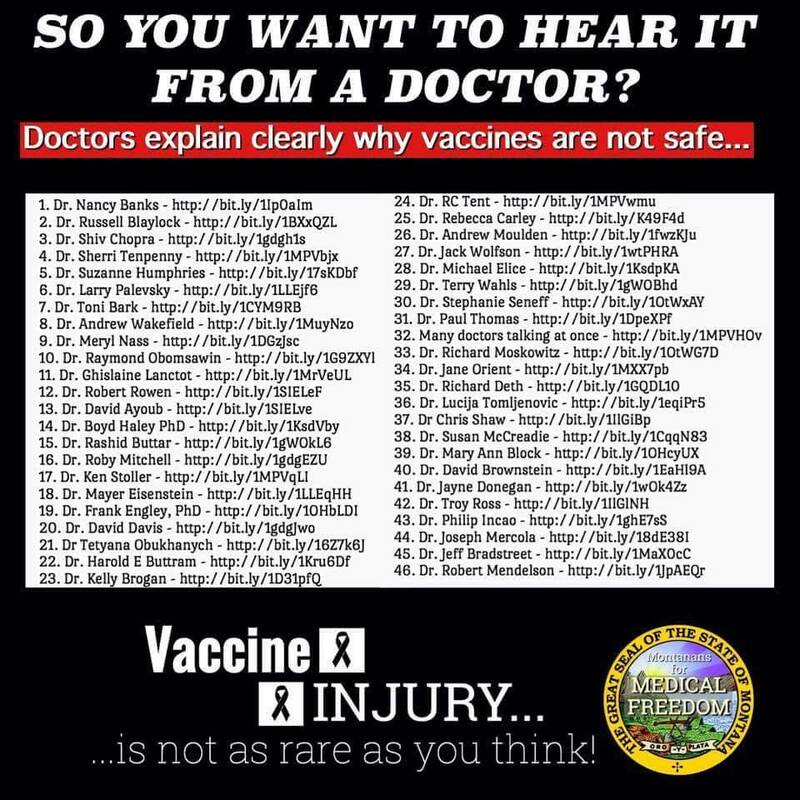 These “authorities” & “experts” do not tell us more people, by far, will be hurt, maimed or killed by the vaccine … than by the “disease”! Coming soon to adults & everyone! & not by choice – our choice on this is very much under attack. You’ve heard of the scene in California? (SB 277? SB 276? No?) Well, more recently then, New York state (Rockland County) & NYC, using the law as a sledgehammer, forcing vaccinations on those of all ages? I think there IS a conspiracy. I want you to do one simple thing. Do not accept & mindlessly swallow the vaccination religion! Is read a vaccine “insert” or monograph. Find the MMR monograph right here. Read it All The Way Through! … available to help you with your digging. You would not even believe the amount of good information that’s out there! Swallowing the Kool-Aid is dangerous. It’s very bad for your health. Very dangerous indeed! I’m not counselling anyone to abandon any other religion they’ve sworn allegiance to. Stay with it, by all means, if your heart & head insist. It does not counsel wilful ignorance, blind faith/belief in dogmas that are actually bad for your health, & for the health of your innocent children, &/or violence or intolerance toward others in any form whatsoever. All the more reason, surely? To leave them the heck alone once they’re born? Thanks to Mother Nature or God or the Universe; take your pick. So yes, it really all comes down to choice. Will you discover there are scientists (even many scientists) who still claim vaccines are safe? You can read some dynamite quotations about the state of science today here. Reading a few of those will help you realize that you must not place science, or scientists (or frankly, anyone at all! ), on a pedestal. Scientists are just human beings, like everybody else. They are fallible. They have biases … blind spots, weaknesses, neuroses. Just like all of us! Listen. I know very well that none of us enjoys being fooled. Manipulated. Feeling as though we’ve have been successfully “snowed.” Played. Conned. Made fools of. I get that. I’ve been fooled & conned plenty in this life, believe me. Yes, it’s painful to realize, & to have to admit to. Nobody likes feeling stupid! It’s hard on our fragile egos, isn’t it? But it does happen to all of us. The truth is what’s important; is it not? It's late in the game, I think. I write about that, in other contexts. But … we are still here, now. We need to keep our bodies (& minds!) as safe & clear as possible. Protect our precious children, for heaven’s sake!!! Let’s stop swallowing the sound bites. & turn our intelligence, instead, from fear to curiosity, a nice phrase I picked up from Dr. Kelly Brogan here. A few words about North America (& the world’s!) top-top-top “messiah,” or guru, on vaccines. A man to whom the entire world vaccination establishment bows down in obeisance. & has done, for decades. Stanley Plotkin got a nasty shock a year or so ago, when he was asked a great many very inconvenient questions about his life’s work on vaccines, in a court case he’d volunteered to take part in. Under oath, he told the truth. Many, many truths. You can find the written transcript here. About his work for all the major vaccine manufacturers (these, for the record, are the titans of the pharmaceutical industry: Merck, GSK, Sanofi, Pfizer). His involvement in the CDC’s ACIP (Advisory Committee on Immunization Practices) – which makes decisions that affect the lives of billions of people, all over the world! Dr. Plotkin is quite an individual. You will get quite an education from him. Oh my. And if you have ever had any question or doubts about the “foxes minding the henhouse” (I have much experience with this phenomenon, having been a nuke-watcher for 13 years now), I think it may be time for you to lay them aside now. Del Bigtree has had several Plotkin deposition excerpts in recent episodes of ‘Highwire.’ (Do a search for these on Highwire, Bigtree, Plotkin, YouTube.) Or, start here! p.s. there are many great quotations about vaccines here. Many new ones from MD’s in the next posting! Vaccination: Dissenting Doctors Have Their Say. p.p.s. many great (& highly relevant) quotations about science, here. … that, for the record, I myself did not know, 3 1/2 years ago. 1. 1986, the U.S. Congress acted to release vaccine manufacturers from liability for vaccine injury claims. This release from liability led to a steep rise in the # of vaccines being given to babies/children (i.e., on the CDC’s ever-growing vaccine “schedule”), & a corresponding rise in autism rates. (I know, that’s really 3 or 4 things.) Here are two graphics that tell part of the tale. Go here to see what the rise in vaccines has looked like here in Ontario. 2. Why did they do this? Vaccine manufacturers were faced with many lawsuits over vaccine injuries caused by the DPT (diphtheria, pertussis, tetanus) vaccine. They claimed they were going to go broke. It’s pretty easy to see that, once a company is released from blame or liability, it clearly no longer has any incentive to maintain product safety. DPT, btw, will come up again. It’s a big deal. 3. The U.S. National Vaccine Injury Compensation Program (NVICP) was formed to handle vaccine injury claims, & has since paid out over $4 Billion. For a very abbreviated description of the program, go here, or even better perhaps, here. The book The Vaccine Court: The Dark Truth of America’s Vaccine Injury Compensation Program tells the history of the compensation program. 5. “Health” officials claim vaccine injury is terrifically rare. In fact, it is very widespread, very common indeed. It is estimated that the VAERS (Vaccine Adverse Event Reporting System) captures only about 1% of the actual number of vaccine injuries that actually occur. Not only is vaccine injury not rare, the possible side effects are shockingly varied & numerous. (See this item for a good list.) This intriguing item from the VAERS folks gives some details about what is considered “reportable” & in what time frame. 6. Since 1986, when the # of vaccines being administered began its meteoric rise, children started being given multiple vaccines at the so-called “well baby visits.” Science had never established that this practice was safe, & indeed it is not, as this article establishes. 8. A prime example of media blackout is this one: CDC whistleblower Dr. William Thompson’s revelations about fraud at the CDC surrounding vaccines & autism. The world heard about this mostly from the independent documentary ‘Vaxxed’ – not from mainstream media. Had you heard about this whistleblower? I rest my case. (Here is a short item about the whistleblower & the CDC malfeasance, from a U.S. Congressman speaking in Congress.) This fraud, btw, involved lying about a vaccine-autism connection that had been discovered – back in the early 2000s – manipulating research findings, & literally burning evidence in a big garbage can! Not a small potatoes kind of a deal. 9. Vaccine science: Shockingly, vaccines are not properly assessed for safety! Vaccine science is very shoddy science, indeed. Proper placebo studies are not conducted! See also, at much greater length, this item, which details the long history of lack of proper safety testing for vaccines. 10. Vaccines are not only not safe (we’ve already covered that; vaccine injury is disturbingly widespread), nor are they particularly effective! Vaccinated individuals routinely contract illnesses they’ve been vaccinated against. See here & here. 12. There is no flexibility with the administration of vaccines. It’s a “One size fits all” paradigm that lumps together all children – despite possible underlying mitochondrial disorders, genetic propensities, previous injuries & reactions, diseases or conditions, etc. One size does NOT fit all! This ought to be apparent even on the level of common sense, really, don’t you think? 14. “Herd immunity” is one of the key sound bites/concepts used to manipulate people into vaccinating. Herd immunity is bogus. 18. This doctor is in very good company! Many doctors are walking away from the vaccine paradigm. This list gives you an indication of this. Here in graphic form is a slightly different list, with links to each of the doctors. Here is a great (& very recent) short discussion by a doctor from Oregon – a busy pediatrician (a vaccinating pediatrician, for the record) – discussing what would happen if nobody followed the vaccine schedule. Pretty enlightening! You can find a number of quotations (from doctors) about vaccines in this document & many more in this one. 19. Autism has reached epidemic rates: it’s now at 1/36 in the U.S. In Canada? 1 in 66, according to this article from a year ago. 20. As referenced above, the rate of autism has skyrocketed. But it isn’t “just” autism that is rising precipitously. So are many other diseases/problems/conditions/issues affecting today’s children. ** Okay. I promised 20, & there you have them. But I’m just getting started! I have 10 more in the pipeline, to be posted shortly. & then another 30 or more after that. There really is a lot to know in order to really understand the vaccine paradigm. It’s a very complex topic. Sound bites do not even begin to do it justice. Some digging – some research – & an open, questioning attitude are required. A helpful image when thinking about the vaccine issue. 21. Here is the # 1 most shocking thing of all about the whole vaccine scene, in my personal opinion. Each vaccine vial is accompanied by a product “insert” with extensive details about vaccine contents & the vaccine’s possible risks & side effects (see sample below). The “monograph” is a longer item (often as many as 29 pages). Please check one out! Here’s one. I know you can’t read this. I’m inserting it to show you how very extensive the information on an “insert” is. This is an MMR (i.e. measles, mumps, rubella) insert. I had to pretty much beg my M.D. to give it to me. Doctors do NOT read these out to patients/parents, nor do they provide patients/parents with a copy. Nor does the nurse at a vaccine clinic in a public setting, or if the clinic is in a school (nor, presumably, does whoever it is doling out flu shots in the grocery store). In other words, we have not provided our INFORMED CONSENT to the procedure, prior to the procedure … because we were not fully informed! It seems that vaccines are simply a matter of blind faith! Rotavirus (oral) live virus vaccine. So, that is to say, 7 vaccines at one time (it takes putting needles into both of the infant’s thighs now. You might not have known that). Think unknown, unpredictable synergies (inside the tiny body of a 2-month-old infant). Think: this has never been proven to be safe! & it is not. (2017 Ontario vaccine schedule compared here to the schedule in 1983. See this page for all of Canada’s vaccination schedules, Birth to Grade 12.) Think: how can it be most of us don’t know all this?? 23. MIT scientist Dr. Stephanie Seneff explains both briefly & at much greater length how she believes vaccines contribute to autism. A short (8 minute) item here covers quite a lot of territory. A long lecture positing ‘Glyphosate + Mercury + Aluminum = Autism’ is here. Dr. Seneff predicts that by 2025, half of all children born could be autistic. 28. The clear legal basis that vaccines cause autism has also been laid out. You can read about that here. 30. Why have so many parents lost trust in the medical community regarding vaccines? It’s because so many who did place their trust in doctors/the medical community wound up having their children harmed by vaccines. (This 2-minute item on Facebook explains the ‘ex-vaxxer’ phenomenon succinctly.) After a child has been vaccine-injured, parents generally find the “health” professionals they deal with denying the injury happened, pooh-poohing what has happened to the child/family, shaming and minimizing them; and, of course, failing to report it to the authorities as a vaccine injury (this is why in the U.S. only about 1% of vaccine injuries are reported to VAERS - the Vaccine Adverse Events Reporting System; note that neither such a coherent reporting system, nor a compensation program, exist here in Canada). Most “health” care system professionals utterly fail to help affected families deal with what has taken place following a vaccine injury. Parents are then forced to deal with their new situation by relying on other parents who’ve been though a similar experience, & casting about for practitioners who will actually help them, rather than bullying, minimizing or shaming them. The vaccine topic is a very polarizing one. (Yikes! Slight understatement, eh?). Emotions run high. Sometimes logic seems to fly right out the window! Family members fall out over it. Seems like everyone has the same goal: to protect children’s health (although I don’t think that is the pharmaceutical industry’s agenda, exactly). Yet one really odd thing is how little compassion is shown for the families of vaccine-injured children. The tone in the mainstream (i.e., pharmaceutical industry-influenced) media these days is becoming pretty vicious. One would think it quite punishment enough to have a child who’s been harmed by vaccines (or who died), without having nasty slurs made about one’s motives & intelligence on top of the nastiness (or tragedy) that has already occurred! (In some cases, as I say, we are talking about people whose babies/children/teen-agers/family members have died!) Here is a moving piece from 7 years ago, touching on this topic of (the seemingly ever) growing lack of compassion. ** I have 10 more in the works…. then another 30 or more after that, in groups of 10. Such a lot most folks don’t know about vaccines. Complex topic! ** Meanwhile, have a gander at this item! Simply a TON of good information there. ** A lot of vaccine quotes here. Science Quotes here. & many great quotes about truth here. Doctors are paid to vaccinate: may kick you out if you dissent! Can we really trust Big Pharma? Vaccine Head Guru Dr. Stanley Plotkin: simply amazing admissions! Measles: good for immune system, prevents later cancer (etc.) Plenty about measles here. MS as a side effect of … well, a great many vaccines. Check out Neil Miller’s VACCINE SAFETY MANUAL to learn lots! Pregnant women – flu shots, DPT, etc. Best watch out!! Smallpox: the story here = also not what you think! (Leicester, Humphries & also here) – How public health measures actually saved the day! Wakefield study – ad hominem attacks. Read the paper for yourself! Media: what is the deal??? Synergies, people! Watch out for the synergies! Note: Some, but not all, of these topics are addressed in the monster posting Vaccines: Miscellany, A - Z .